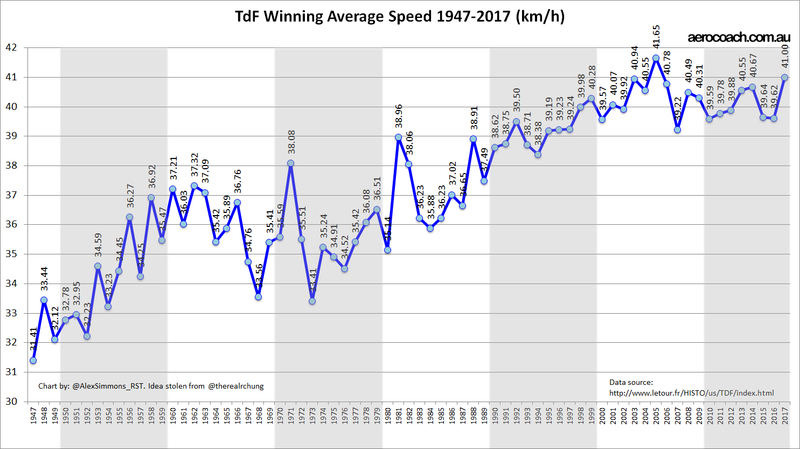 The 2017 edition of the Tour was a pretty quick tour in terms of average speed, and I suspect the relative lack of mountains played its part in that. Having said that, I can't specifically say whether of not the number of ascent meters was substantially different, it was just an impression from looking at the overall route. Last year I posted an item with various charts about speed trends for the Tour de France. If you want to know more about the charts, what they mean, the data and where I stole the idea for some of them from (thanks Robert Chung) then have a read of that earlier post - it's not overly long. So here's an update of the charts to see where 2017 falls. 2017 was the second quickest Tour on record. 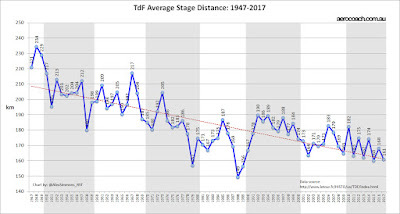 How about average stage distance? Right in line with the overall trend of shorter average stage distances. This may well continue as the ASO experiments with more short punchy stages, plus the ITT distances were less than in most recent tours. We can see 2017 is still within the speed v distance cluster of 21st century Tours. Here we see the 2017 edition is right in line with the expected trend. 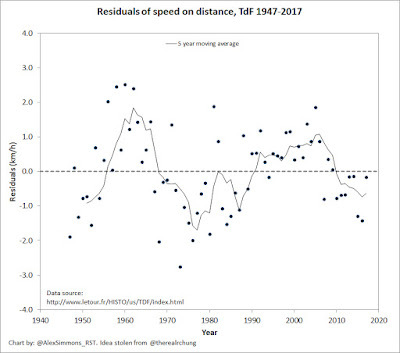 Now the obvious question about the overall trends relate to two other factors besides overall distance, one being impact of doping during different eras and the other being total ascent meters during the tour as a proportion of total distance. The doping stuff has been done to death here and elsewhere and there really isn't much in these plots to definitively say much about it anyway. You can look at the peak in residuals in the period of 1990s to 2000s and say "ah ha! doping!!" but then you'd also have to explain the other peak in residuals from late 1950s to 1960s. No EPO or blood bags back then. So while doping has played its part, it's not the only or whole story. About the amount of climbing though, in the last year I made an attempt to work out the number of climbs ascended each Tour. I went through online archive data to count the number of times each col was climbed in the tour for each year. It was pretty laborious research. I got to something like 750 different mountains in the database and counts for each year, but was unable to complete the project of identifying the data for each (distance, vertical metres, gradient), nor did the archive identify in which direction the mountain was ascended. which matters quite a bit for some climbs. Add to that the archives were not consistent in which climbs were included in the stage descriptions - and climb categorisation (i.e. HC, Cat 1, 2, 3, 4) has evolved over the years. It became apparent that unless there is a source available that provides the actual race routes, then attempting to work out the meters ascended for each year was a pretty futile task. I gave it a go though. 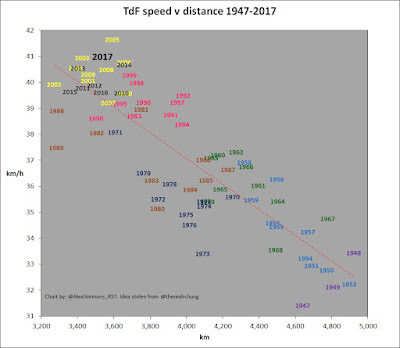 Perhaps someone out there has actual race route data going back to 1947? If that's the case then we can map them using current technology to come up with a pretty decent indicator of ascent and descent metres for each edition of the Tour. Conclusions? Not a lot with respect to 2017 edition. It's pretty much on trend. Thanks very much for this, very interesting! 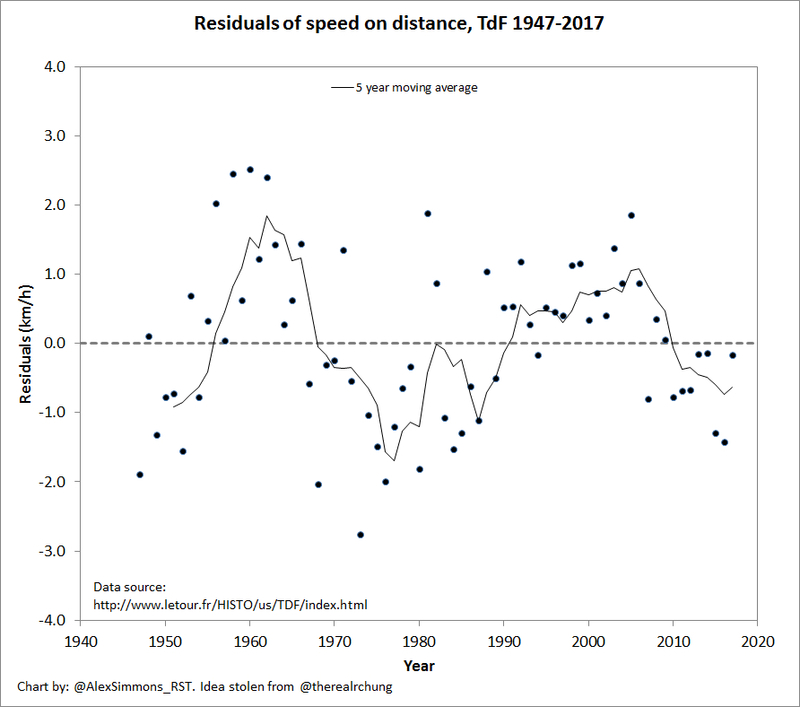 You may be interested in a similar analysis I've done looked at the differences in average and fastest speeds of the tour over time. I've not got 2017 included but I will have soon. Because a substantial portion of your writings deal with the same type of material, I believe I am not the only one who would be interested on whether you have had time to go through the material and if you have, what are thoughts on it (possible strengths and weaknesses, the soundness of the approaches etc.). I think that I am not the only one who is just perplexed about the claims and how contrary they are to the mainstream view of the rEPO-fueled fast 1990s with fast Alpe d'Huez ascent times etc. This material seems just keep coming, and I think you have noticed that these studies have been emerging now some half a dozen of years and have been briefly mentioned in the report of the Cycling Independent Reform Commision (CIRC), not to mention that the recent not-totally-convincing Mt. Ventoux rEPO research came also from Netherlands. Personally I have no clear opinion about the matter. On the other hand, the anecdotal evidence on the efficacy of rEPO seems strong, but I find it always strange that I can't recall seeing any academic attempts to debunk the Dutch findings. Even a precursory opinion would be interesting to read from someone familiar with the subject matter. Sorry to be late to the party. 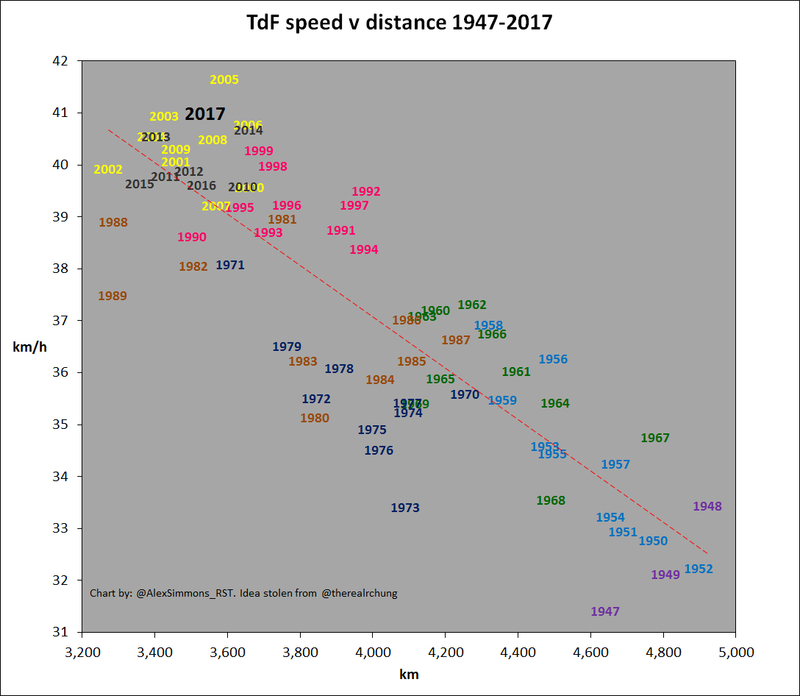 With respect to the residuals plot and doping behavior, I did similar plots of speed vs. distance for the Giro and Vuelta. As in the TdF residual plot, there are periods of years where the residuals were positive, and periods of years where the residuals are negative -- but the years are *not the same* as for the TdF. Thus, if you thought that the residual plot was evidence of doping behavior in the peloton, you'd have to explain why doping behavior had a different time pattern in the Giro, the Tour, and the Vuelta.